An award of nominal DPA damages in the High Court. Whether, or in what circumstances, compensation may be awarded to a claimant who shows a contravention by a data controller of any of the requirements of the Data Protection Act 1998 (DPA), is a much-debated issue. It is also, occasionally, litigated. One key aspect is when compensation for distress might be awarded. But that case was ultimately settled before trial, and the issue left undecided. This is a controversial question of law in a developing area, and it is desirable that the facts should be found. It would therefore be the better course in the present case that I should not decide this question on this application. This is a fascinating point, and detailed judicial consideration of it would be welcomed (it may also be at issue in the impending case of Steinmetz v Global Witness Ltd) but, in the meantime, a question exists as to whether nominal pecuniary damage opens the door to awards for distress. In Johnson, the cost of a £10.50 breakfast had opened the door, but this was actual (if minor) damage. Last year, the Court of Appeal avoided having to decide the issue when the defendant conceded the point in Halliday v Creation Consumer Finance Ltd (CCF)  EWCA Civ 333 (about which I blogged last year). However, in a very recent judgment, AB v Ministry of Justice  EWHC 1847 (QB), which takes some wading through, Mr Justice Baker does appear to have proceeded on the basis that nominal damages do give rise to distress compensation. The case involves an (anonymous) partner in a firm of solicitors who, as a result of events involving the coroner following his wife’s tragic death, made a series of subject access requests (under the provisions of section 7 DPA). The Ministry of Justice (MoJ) did not, it seems, necessarily handle these well, nor in accordance with their obligations under the DPA, and when it came to remedying these contraventions (which consisted of delayed responses) the judge awarded nominal damages of £1.00, before moving on to award £2250 for distress caused by the delays. What is not clear from the judgment is to what extent the judge considered the MoJ’s submission that compensation for distress was only available if an individual has also suffered damage. The answer may lie in the fact that, although he awarded nominal damages, the judge accepted that AB had suffered (actual) damage but had “not sought to quantify his time or expense”. Query, therefore, whether this is a case of purely nominal damage. One hopes that Vidal-Hall and Global Witness give the occasions to determine these matters. One notes, however, the vigour with which both cases are being litigated by the parties: it may be some time before the issue is settled once and for all. I am not a lawyer, but I’m pretty certain that most commercial litigation strategies will be along the lines of “don’t waste lots of money fighting a low-value case which sets no precedent”. And I know it is a feature of such litigation that some companies will not even bother defending such cases, calculating that doing so will cost the company much more, with no other gain. John Lewis has been ordered to pay damages for sending “spam” emails in a privacy ruling that could open the floodgates for harassed consumers. For a detailed exposition of the PECR provisions in play, see Tim Turner’s excellent recent blog post on this same story. So I doubt very much whether the award to Mr Mansfield was anything other than a small sum (so the albeit tongue-in-cheek Register reference to a PILE OF CASH is very probably way off the mark) . I have asked him via his twitter account for details, but have had no reply as yet. Perhaps the most important aspect of this story, though, is the extent to which it indicates the way the courts might interpret the relevant consent provisions of PECR. As this was a case in the County Court it sets no precedent, and, unless someone decides to pay for a transcript of the hearing we’re very unlikely to get any written judgment or law report, but the principles at stake are profound ones, concerning how electronic marketing communications can be lawfully sent, and about what “consent” means in this context. The issue will not go away, and, although I suspect (referring back to my opening paragraph) that John Lewis chose not to appeal because the costs of doing so would have vastly outweighed the costs of settling the matter by paying the required damages, it would greatly benefit from some proper consideration by a higher court. And another important aspect of the story is whether behaviours might change as a result. 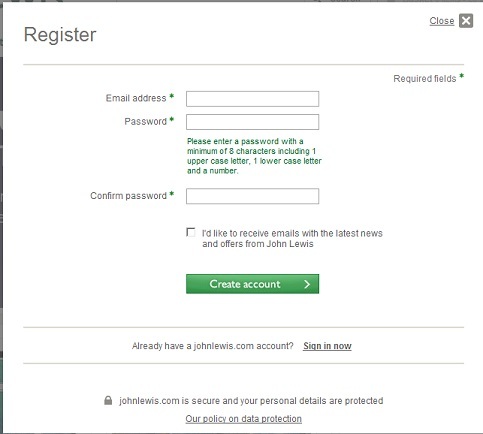 Maybe they have: I see that John Lewis, no doubt aware that others might take up the baton passed on by Mr Mansfield, have quietly amended their “create an account” page, so that the opt-in box is no longer pre-ticked. In a comment below a pseudonymed person suggests that the damages award was indeed tiny – £10 plus £25 costs. It also suggests that John Lewis tried to argue that they were permitted to send the emails by virtue of the “soft opt-in” provisions of regulation 22(3) PECR, perhaps spuriously arguing that Mr Mansfield and they were in negotiations for a sale. The distressing case of Sheila Holt, a woman in a coma, who was “harassed”* by the Department of Work and Pensions (DWP), and Seetec (DWP’s contractor carrying out work capability assessments) when they sent letters to her demanding she attempt to find work, casts light on an aspect of data protection law which is sometimes overlooked, at the expense of, for instance, data security. I think Sheila Holt’s case suggests a possible serious contravention of the Data Protection Act 1998 (DPA) regarding the need to hold accurate records of people’s personal information. If it were indeed found to be a serious contravention, it could give rise to the possibility of a civil claim against those responsible, and enforcement action by the Information Commissioner. We have all, I’m sure, been exasperated by organisations which fail to update their records, or mix our records up with someone else. This exasperation has even found an outlet of sorts in comedy. But behind it lies a point given serious focus by Sheila Holt’s case, and it relates to a legal obligation under the DPA. I will explain in a little detail how this works, but it does occur to me that the DPA is an underused weapon in citizens’ and consumers’ armoury, when faced with unyielding bureaucracy, and at the end of this post I will suggest an approach people might take in such circumstances. Please note – none of this is new, and for some readers of this blog it is basic, but I thought it would be helpful to lay it out, for any future reference. I remind readers that it is not to be taken as advice, let alone legal advice. In what follows, the aggrieved individual is a data subject, and the organisation with inaccurate records is the data controller (this is a broad generalisation for the purposes of this post). By s4(4) of the DPA a data controller must comply with all of the data protection principles in Schedule One of the DPA, and the fourth principle says that “Personal data shall be accurate and, where necessary, kept up to date”. If a data subject wants to check the accuracy of the records held on them, they can submit a request under section 7 of the DPA. This gives a broad entitlement to know who is holding their information and for what purposes, and to have the information “communicated” to them (generally in the form of copies/print-outs). If the records are shown to be inaccurate then the data subject should notify the data controller and require them to correct them. If they fail to do so, and continue using the inaccurate records, and the inaccuracies give rise to serious (or potentially serious) consequences, then the data subject may be able to serve a legal notice requiring the data controller to stop: Section 10(1) DPA allows a data subject to serve a data controller with a notice requiring it to cease processing data which is causing or is likely to cause substantial damage or substantial distress (and that damage or distress is unwarranted). Section 10(3) DPA requires the data controller within 21 days either to comply with the 10(1) notice, or provide reasons why it will not. Section 10(4) allows a court, upon application from someone who has served a 10(1) notice, to order steps to be taken. So, it is at least possible that a data subject who has been put to considerable time, or cost or effort because of inaccurate (“unwarranted”) records, can serve a section 10 notice. However, if this doesn’t apply (perhaps the damage or distress can only be described as minor) there is a more direct legal route: Section 14(1) DPA allows a court, on the application of a data subject that personal data of which the applicant is the subject are inaccurate, to order rectification. Additionally, there may be the possibility of compensation. Section 13(1) DPA provides that “An individual who suffers damage by reason of any contravention by a data controller of any of the requirements of this Act is entitled to compensation from the data controller for that damage”. Section 13(2) provides that “An individual who suffers distress by reason of any contravention by a data controller of any of the requirements of this Act is entitled to compensation…if the individual also suffers damage by reason of the contravention” (emphases added). So, no compensation for distress unless “damage” can be shown (per Buxton LJ “…section 13 distress damages are only available if damage in the sense of pecuniary loss has been suffered…” in Johnson v Medical Defence Union  EWCA Civ 262). But if a data subject can show pecuniary loss, the door to distress damages is opened (possibly even if the former is only nominal – see Halliday v Creation Consumer Finance Ltd  EWCA Civ 333 where the defendant conceded nominal damages of £1, thus allowing a section 13(2) claim to proceed). One further or parallel recourse for an aggrieved data subject is to ask the ICO, under section 42 DPA to assess whether it is likely or unlikely that that the handling of their data has been or is being carried out in compliance with the Act. A “compliance unlikely” assessment could, potentially, be used to bolster a claim under sections 10, 13 or 14. Moreover, it could lead to potential regulatory action against the data controller (for instance a civil monetary penalty notice under section 55A DPA, or an enforcement notice under section 40 DPA – although it should be noted that it would have to be a particularly serious breach of the “accuracy principle” to warrant such action, and to date, none such has been taken by the ICO). Systematic or egregious inaccuracy of records can often be an indicator of deeper information management failings, which should draw the ICO’s attention. The Information Commissioner’s Office (ICO) has helpful guidance on taking a data protection case to court. In 2009 the Information Commissioner prosecuted Ian Kerr, the then chief officer of a body called the Consulting Association. The Consulting Association had been holding a blacklist of people within the construction industry seen as “troublemakers” (a blacklist inherited from the Economic League, as detailed in Tim Turner’s superb post on the subject) and making this information available to clients on payment of a fee. The fall-out from this continues to this day, with, on the one hand civil claims being pursued, for what I understand to be common law “unlawful means conspiracy” and defamation, and on the other hand, the reports that the Information Commissioner’s Office (ICO) has been asked by Business Secretary, Vince Cable, to investigate allegations that the practice has continued to this day, on major construction projects like the Olympic Park and Crossrail (by the way, the extraordinary testimony of Gail Cartmail of Unite, in that last link, is essential reading). The ICO’s prosecution of Kerr was for the relatively minor (and relatively rarely enforced) offence under the Data Protection Act 1998 (DPA) of failing to register with the ICO for his processing of personal data. No other sanction was, apparently, open to the ICO at the time. This was because the current regime of civil Monetary Penalty Notices (MPNs) for serious contraventions of the DPA had not then commenced. As Chris Pounder pointed out at the time, there is even a query, applying the strict definitions of “data” in section 1(1), whether a blacklist held solely on paper, and arranged in, say, date order (rather than by reference to individuals), is even caught by the DPA. If not, then enforcement by the ICO would not be possible. This is because “data” broadly applies only to electronically-processed information or information held as part of a filing system structured by reference to individuals or criteria relating to individuals. One hopes that any alleged blacklisters haven’t made a habit of reading Chris’s blog and subsequently exploited a loophole that remains open. Putting to one side this “loophole” point, it is likely that any processing of personal data which unfairly and unlawfully deprived someone of employment would constitute a serious contravention of the DPA, probably causing substantial damage and distress, and thus potentially attracting an MPN. An MPN is a relatively powerful weapon in the ICO’s armoury, and in my opinion one that has been used well to drive up data protection standards and drive home the importance of data security. Whether a huge construction firm would notice a (maximum) £500,000 penalty is another matter. And, of course, none of the money paid under an MPN goes to the victim of a serious DPA contravention (it goes to the government consolidated fund). However, it is open to a data subject in such circumstances to bring a claim in the county court under section 13 of the DPA. Compensation is available if specific damage can be shown, and, if damage can be shown, further compensation for distress can follow. It is not clear to me whether the current claims from the 2009 events contain DPA claims, but the fact that they are being reported primarily as claims for tortious conspiracy suggests that even if so, they are subsidiary to the latter. Ensure that if any personal data relating to recruitment is obtained from a source other than the data subject, the data subject is, in so far as is practicable, provided with the information specified in paragraph 2(3) at Part II of Schedule 1 to the [DPA] in accordance with the First Data Protection Principle. Ensure that if any personal data relating to recruitment is disclosed to a third party for use in connection with the recruitment of workers, the data subject is, in so far as is practicable, provided with the information specified in paragraph 2(3) at Part II of Schedule 1 to the [DPA] in accordance with the First Data Protection Principle. The notices do not appear to have been effective only for a fixed period, so one is to assume that they remain effective*. If any of the firms upon which they were served have sinced breached the terms of the notice they could potentially have committed an offence under section 47(1) of the DPA. That offence is triable either-way, and anyone found guilty is liable on summary conviction, to a fine not exceeding £5000, or on conviction on indictment, to an unlimited fine. And, by section 61 of the DPA, where, as here, the notices were served on bodies corporate, the bodies’ directors and some other officers can also be guilty of the offence of failing to comply with an enforcement notice if the offence is proved to have been committed with their consent or connivance or to be attributable to their neglect. One wonders if the ICO’s 2009 enforcement proceedings may still have some part to play. *The ICO has confirmed to me that they have no record of any of the Enforcement Notices being cancelled or varied, nor of any applications to cancel or vary being received. The ICO considers that the Enforcement Notices are still effective. The Court of Appeal has held that the Bank of Scotland is liable for harassment in making hundreds of calls to someone who exceeded her overdaft limit. With the Information Commissioner taking recent robust action we all know that the making of unwanted calls by commercial organisations can be a breach of The Privacy and Electronic Communications (EC Directive) Regulations 2003 and the Data Protection Act 1998. However, a recent Court of Appeal judgment has held that this practice can also constitute harassment, even when the calls are made by one’s own bank, in pursuit of a debt. In Roberts v Bank of Scotland the claimant – a valiant litigant in person – had sought and was awarded damages in the County Court in the sum of £7500, under section 3 of the Protection from Harassment Act 1997. The Bank appealed, both on liability and quantum, and I suspect they wish they hadn’t. The claim was made after the Bank made 547 calls in little more than a year, arising from minor instances of exceeding overdraft limits. Ms Roberts did not want to speak to call centre operatives, and had apparently sought unsuccessfully to speak to her local branch manager. Many of the calls were intimidatory, albeit couched in polite language. Despite Ms Roberts repeatedly asking for them to cease, she was told the calls would continue. The Appeal Court had no hesitation in dismissing the Bank’s appeal, and did so in extraordinarily disapproving terms. That last comment, and indeed the judgment as a whole, is pretty ominous for any organisation seeking to pursue and persuade debtors by a process of repeated phone calls (for which, now read “potential harassment”) when the recipient has asked them to desist. Lord Justice Jackson suspects his comments might be greeted with “derision in the boardrooms of the banks”: I suspect they may be also be greeted with consternation, and concern about the future of an element of banking practice which has effectively gone on unchecked for years. They would hardly have brought this appeal, over for what is for them a minute sum of money, unless they thought the case had wider implications which threatened their business practices. They now will need to lick their wounds, and reconsider their approach to commercial morality and legality.